The new U.S. tax law and the OECD’s project to curb corporate tax avoidance are forcing global businesses to reassess their finances. This month, moreover, both the European Union and the Organization for Economic Cooperation and Development are to publish reports on reforming digital economy taxation that could affect internet-based companies significantly. Amid this shifting landscape, Bloomberg Tax asked Melissa Geiger, KPMG LLP partner and head of international tax in the U.K., about the global tax issues facing multinational companies. Geiger rejoined KPMG in October after three years as global head of tax at GlaxoSmithKline Plc, the FTSE 100 pharmaceutical business. In 2008, before moving to GSK, she became KPMG’s youngest female equity partner. 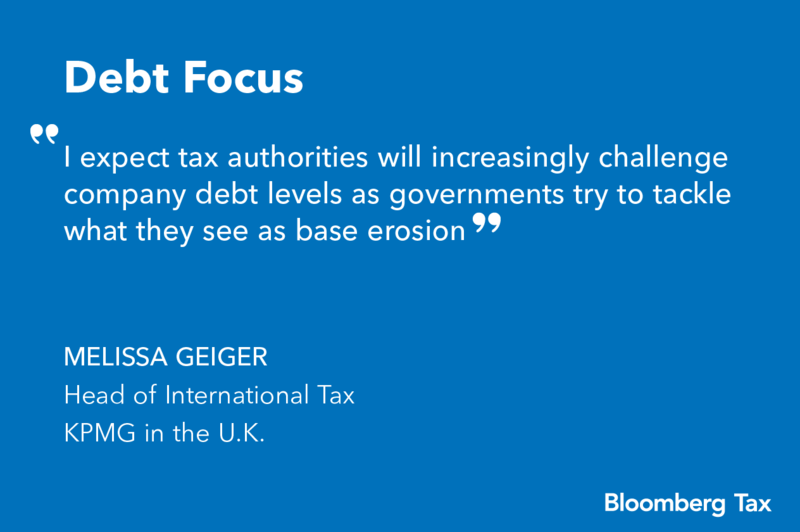 In a written Q&A, Geiger told Bloomberg Tax about what areas of multinationals’ finances she expects tax authorities to focus on as a result of the OECD’s 15-action Base Erosion and Profit Shifting project. In addition, she highlighted her concern about how the U.K.’s efforts to combat perceived tax avoidance among multinationals is hurting the country’s attractiveness to global businesses. This is the second installment of a two-part interview. Read the first part, focusing on U.S. tax reform, here. Bloomberg Tax : Countries are still implementing legislation derived from the OECD’s BEPS project—which H&M’s head of tax has said will increase companies’ disputes with governments. What are the key BEPS issues that multinational businesses need to consider this year? Melissa Geiger: To my mind there are two major issues in relation to BEPS that companies need to be on top of. Firstly, their transfer pricing (policy, master file, and operational risks) as transfer pricing controversy and disputes are increasing. Most companies have now submitted their first country-by-country reports (CBCR) and this is also very likely to lead to more disputes. Are companies ready? Have they made sure they have the right internal resources to deal with the increase in disputes, and is their approach consistent across the globe? Truly global tax teams, with clear global TP policies, will respond much more coherently and consistently to these challenges. Secondly, multinational businesses will be looking closely at their capital structure and debt distribution across their group—implementing the new rules on interest restrictions will be key. For example, the U.K. has introduced corporate interest restrictions recently which are incredibly complex and are still being grappled with. But groups also need to understand their broader debt profile. I expect tax authorities will increasingly challenge company debt levels as governments try to tackle what they see as base erosion. 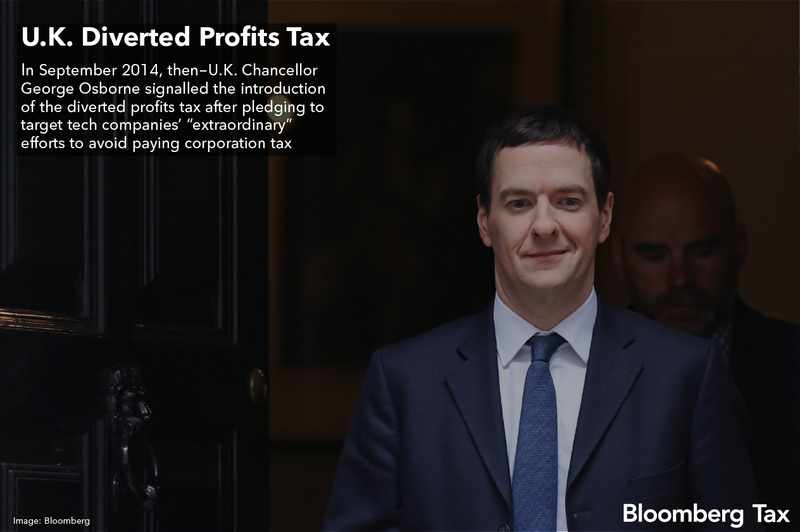 Bloomberg Tax : Amid the first stages of the BEPS project in April 2015, the U.K. introduced its diverted profits tax. How much of a “game changer,” as a senior U.K. tax authority official described it in November 2017, has the DPT been from your perspective in changing global businesses’ behavior? Geiger: Looking at the original policy intent behind the diverted profits tax I think there were arguably some situations where it was needed. However, there has always been concern amongst tax payers and advisers about the unilateral nature of the measure and whether it would have been better for the government to wait for the findings of the BEPS project so that any response could be multilateral rather than unilateral. In fact, the OECD expressed this view at the time. I also think there was a genuine expectation that it was going to be targeting the most contrived kinds of ‘profit diversion.’ So I think there was some acceptance of the measure on the basis that it would not impact on the vast majority of situations. The reality is that we have seen it being used to challenge a much broader spectrum of situations than we expected, and it is being pursued relatively aggressively by HMRC. From a U.K. perspective I have concerns about how the extended scope and pursuit of the tax has impacted on the U.K. as an attractive location for investment. We do hear from international clients that the U.K. is not as attractive as it was, in spite of its low headline tax rate, and the diverted profits tax is one of the most common reasons given. Had the practical application of the tax remained where most people believed the policy intent was targeted, I am not sure it would have been a game changer. It probably has turned into a game changer for the U.K., at least in the short term, because it has been a strong revenue raiser. But time will tell whether it keeps that position for the longer term. The impact on the U.K.’s competitiveness will take a while to be felt, if it can ever be isolated and measured with any accuracy, and we may yet discover it was a game changer for the wrong reasons. On the global landscape the diverted profits tax can be seen as a game changer for different reasons, although again I am not convinced this is a positive. At the time when the diverted profits tax was introduced it was an outlier by virtue of its unilateral nature. Over time it does seem to have triggered a rash of unilateral action in other jurisdictions. There are differences in scope (for example, the Australian version goes further than the U.K.’s), but it does seem to have been a trendsetter. We are particularly seeing this unilateral action in response to issues raised by taxing the digital economy. Many jurisdictions are introducing or considering unilateral measures whilst the OECD and the EU work on a more international approach. Where this is leading the international landscape more generally is concerning as unilateral action is much more likely to create an environment where there is double taxation and consequentially more disputes. This uncertainty and risk of double taxation (coupled with lengthy international disputes) does not play well with business. All of these unilateral measures are, in their own ways, trying to reach a situation where complex international business models are being taxed ‘fairly.’ And the key message for business is to embrace the end position that they are all driving towards—that profits arise and are taxed where the value is truly created. The best end position is one where there is international consensus in terms of approach, even if there is the freedom for some domestic divergence. At the moment we don’t have this, and I think we are headed for a few years of upheaval before we hit a steady state. History may tell us that the diverted profits tax was a key trigger for making that happen, in which case it will truly be a game changer, and for good reason. In the meantime, however, a plethora of unilateral measures drive noise and complexity into an environment which is already seeing geopolitical upheaval. In the short term at least, I don’t see that as a good thing. Bloomberg Tax : Is there anything else you want to discuss? Geiger: I think in the more immediate future we can expect attention to be on taxing the digital economy. This is clearly an area of focus for the U.K. government. It is also the subject of international activity at both the level of the OECD and the EU. In the meantime, and as I indicated above, several jurisdictions have implemented or are considering unilateral action. This will be of concern to taxpayers as individual countries adopting their own approach generally leads to an increase in double taxation which will lead to more tax disputes. The taxation of the digital economy raises complex questions around how value is created and monetized in digital business, but there will also be complex questions around the best way to tackle this. Ultimately, the best result for all concerned is that an international consensus on taxing the digital economy is arrived at quickly so that any interim unilateral measures that are introduced in the meantime can be phased out as quickly as possible and that we can achieve a ‘steady state’ sooner rather than later.